The all-important BLUE vinyl surface is in MINT condition and still a glorious rich, dark colour! The Riva labels are in immaculate condition on both sides with the following wording on the 'A' side - "A special edition limited to 3,000 copies, presented to the crew of H.M.S. Ark Royal to commemorate the visit of Rod Stewart. October 1978". The picture sleeve, showing the Ark Royal at sea, does have some light ringwear, but no rips, tears or stains and overall is near mint. This record very rarely appears for sale at all, and when it does it doesn't often come any better than this. 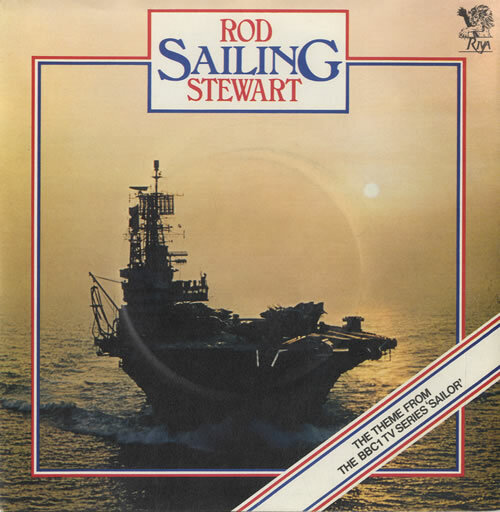 Product Information Rod Stewart Sailing - BLUE vinyl UK 7" vinyl single (7 inch record).